Located outside Fresno, California, the Kearney substation is a major hub point for several electrical transmission lines that distribute power throughout the greater Fresno area. In anticipation of the growing demand on this substation, the utility company that owns it began a project in 2012 to expand the substation. This expansion included the installation of a new 230/70 kV, 200 MVA transformer, building a new four element 230 kV ring bus, extending the existing 70 kV bus, and relocating several of the existing transmission lines. In early 2013, Portland Bolt was contacted by the contractor selected to perform this work. The new transmission structures on the project required anchor bolts ranging from 3/4” to 2” in diameter and from 3’ to 10’ in length. The anchor rod assemblies included large custom manufactured round plate washers that were assembled and welded to the anchor rods prior to galvanizing. The project also required the manufacture of multiple anchor bolt templates ranging from 15” x 15” squares to 45” diameter round rings, each with specific hole placement and sizing. 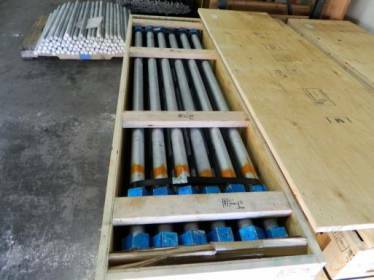 These would be used by the contractor on site to ensure that that the anchor rod assemblies were installed with the correct spacing and layout to match the structures that would be mounted on them. 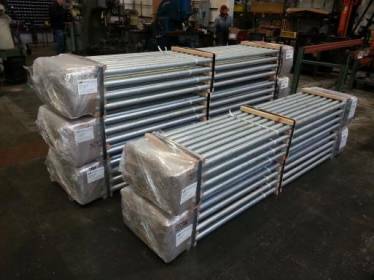 In just over one month’s time, Portland Bolt was able to manufacture, fabricate, weld, galvanize, and package the order. The anchor rods were assembled and packaged into specially built wooden boxes to protect them during transit. The shipment took a dedicated flatbed truck and weighed nearly 32,000 pounds! Do you have a large project or a project with unique fabrication or shipping requirements? Contact one of our experienced estimators and we can help you get the job done!